We live in strange times where things aren’t often what they seem to be. So we have propaganda for political pursuits, media magnifying the crooning stories and lovers promising panacea. Yet when time puts these pledges to test, most meet an inevitable end, like a sentence devoid of meaning…moths to the flame! Love has been reduced to affairs which have about them the permanence of ice cubes in the desert. And jobs are akin to prisons for that monthly salvation of salary. Amidst the thick of things, it’s always good to look closer, look inside to ensure that the child in you never collapses for the color of money, the asylum of ambition or the hiccups of hate. Here’s Google’s latest Commercial celebrating Unlikely Animal Friendships. 1. 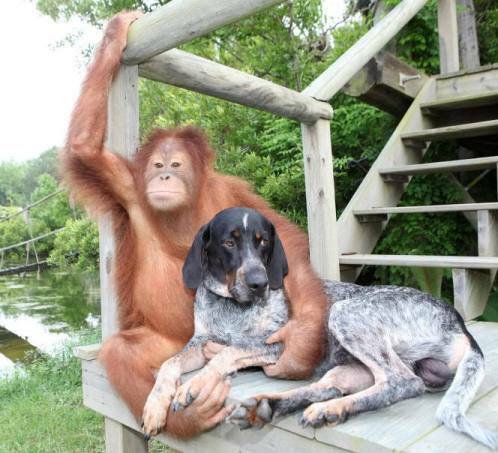 Surya the orangutan and Roscoe the dog, who found companionship at TIGERS (The Institute of Greatly Endangered and Rare Species) in Myrtle Beach, South Carolina. They swim and play together and that’s not all…Surya even takes the dog for his walks. The celebrated friends were recently featured at National Geographic. The tale runs that once when the orangutan was out for his daily elephant ride, he spotted “a worn-out old hound dog.” They ran right toward each other and hugged like long lost best friends. Here are some of their images echoing friendship like only they can. Keep the spirits soaring…the world can still be beautiful! 2. 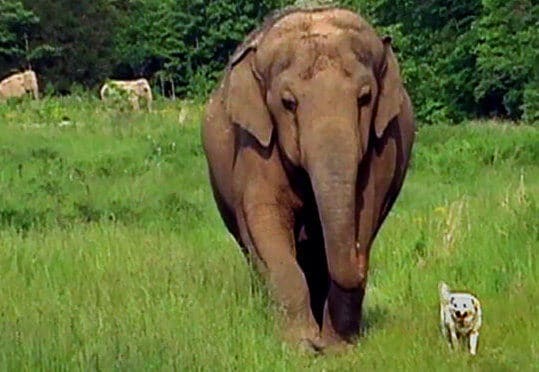 Tarra, the elephant and Bella the dog, at The Elephant Sanctuary of Nashville were inseparable. For nearly a decade, Tarra had been best friends with a rescued dog named Bella, a mutt who wandered onto the sanctuary grounds and into the heart of the gentle giant. “When it’s time to eat, they both eat together. They drink together. They sleep together. They play together,” says Carol Buckley, the sanctuary’s co-founder. For three weeks, the elephant held vigil: 2,700 acres to roam free and Tarra just stood in the corner, beside a gate, right outside that sanctuary office…Then one day, sanctuary co-founder Scott Blais carried Bella onto the balcony so she and Tarra could see each other. “Bella’s tail started wagging. And we had no choice but bring Bella down to see Tarra,” Blais says. In 2011 when Bella died, Tarra mourned her loss gravely; elephants are known for keeping their relations with utmost regards. 3. 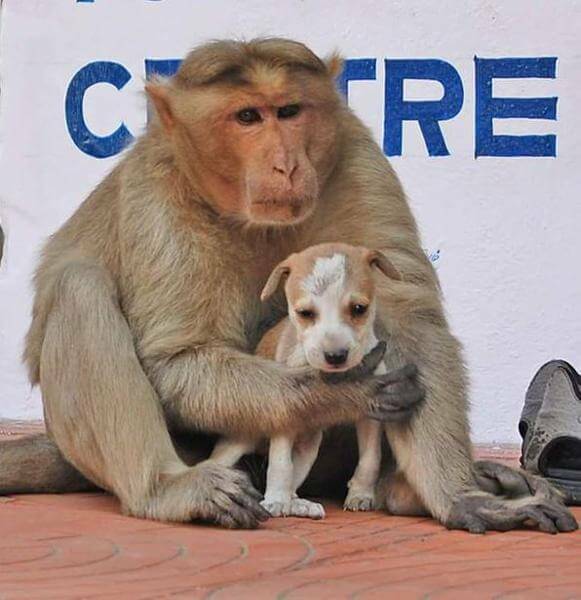 Monkey and the puppy struck off a delightful friendship in New Delhi, India. 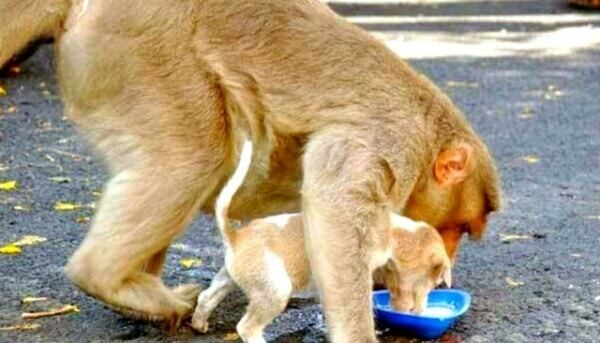 The abandoned pup was adopted by a Rhesus Macaque, who looked after and cared for him as though her own! She let him eat first and ensured that he got enough food. The monkey fights other big dogs on the streets to keep the pup safe, shares food with him, hops from tree to tree clutching the puppy tight and basically cuddles a lot with him. I am just a dog but then I have known this for long that the music may stop every once in a while but you must never forget the song. You must always keep that magical map handy by your side for an escape route ─ to evade the rudimentary reality for an innocent imagination. And if nothing else makes sense and you realize that the map is in an archaic or unknown language, there is still a way out. Start a conversation. Talk to your pet or to any animal in the vicinity. Beguiled by the mesmerizing gaze, in those gyrations of the head and the tail you’d know that your feelings are understood. Believe me, you’d have the conversation as good, if not better than with most humans. There can not be a more simple explanation of defining the steps to a beautiful life! People who identify themselves with nature can try out the same thing with plants and then the refreshing strokes of air and dancing leaves of trees also instill the magic in us that we all yearn for…. Life is indeed beautiful and nothing could perhaps be more wonderful than life itself! How sweet that is.. we have lessons to learn!!! This is so sweet and endearing, it almost brings a happy tear to my eye! What a beautiful thing friendship is. Beautiful !! !,,,Friendship is indeed the best part of life!!!! Pingback: You See How Baby Monkey Makes Friends with Every Animal He meets!